Shower Pan Liner Right the First Time!! Satisfaction Guaranteed! Save time, material and cost in minutes! An eBook is an electronic book, available exclusively as an instant download document. Many people prefer eBooks due to their convenience, instant access, and superior relevance to a topic. EBooks are typically much more up to date than traditional "hard copy" books. The only resource you need for preventing shower leaks forever. Tim, I purchased two of your eBooks ...... Your directions to download them were easy to follow! ..... the eBooks were EXCELLENT references on HOW to do it right! This was the best money I've ever spent!!! Your eBooks are fabulous, full of details, with great pictures to visualize every step. You took all the MYSTERY out of my projects! 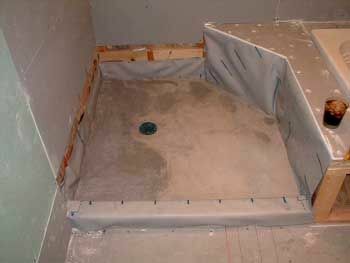 You love the look of a ceramic tile shower floor but are mystified as to how to make the floor leak-proof. 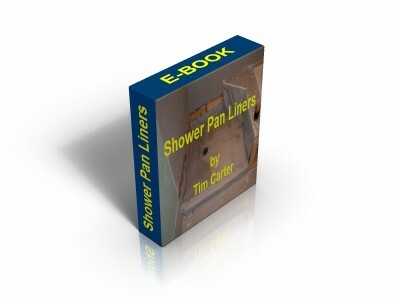 Give me just 30 minutes of your time and I guarantee that my Shower Pan Liner eBook will teach you how to achieve professional results. You can install the membrane perfectly using my simple tips. This eBook was written by master builder and syndicated columnist, Tim Carter. It is straightforward, easy to read, and loaded with simple tips and secrets that only an experienced professional would know. Nothing is taken for granted. Many times a "how-to" writer will mistakenly assume the reader already knows certain key facts, and will not bother to mention those. You are left trying to connect the dots. In contrast, we connect every dot for you in a clear concise yet informative way. A picture says a thousand words, and our eBooks are loaded with color pictures, diagrams and tables. We start at the beginning, take you through every step of the project, and back up each step with pictures. Our eBooks make even the toughest project EASY. If you have ever watched a master carpenter, they make everything look like a piece of cake. That’s because they know the tips and secrets for every step of the job. They have probably learned the hard way. We give you the easy way. "Well, I've got the eBook & am anxiously reading it. 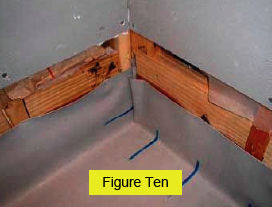 I can already see in the details about leaving a gap in the studs for the membrane fold is the type of info that is invaluable ......... I already like what I see after just reading the first couple of pages. In fact, I liked it so much, I called my wife over to the computer & had her read it with me. ....... Well, I've got more reading to do so I'll get to it!" "Thanks a lot Tim for creating these eBooks. 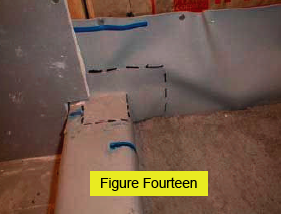 I found the Shower Pan Liner one I purchased to be quite helpful." This eBook is loaded with step-by-step color photos! "This is what I call CUSTOMER SERVICE !!!!!!!! In today's business the customer is not often treated with respect, so I was surprised by your quick response. Thank you." "I expected yet another Internet catastrophe but you and your business helped to make this a very pleasant experience. I finished my project with the help of your eBook and would sincerely like to say Thank You!" This eBook is an instant download the moment your credit is approved. It comes to you in PDF format, that can be viewed with free Adobe Acrobat Reader software. "Having the right knowledge is as important as having the right tools for any project. 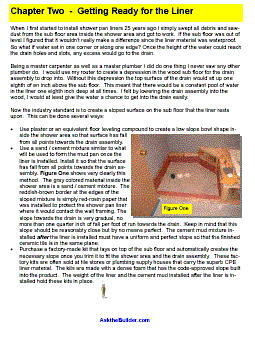 My Shower Pan Liner eBook is an opportunity to discover the invaluable tips that determine the success of your Shower project. We are so confident that you will enjoy and benefit from this eBook that we guarantee your satisfaction, with our no-hassle, no questions asked return policy. You have nothing to lose and everything to gain."